The Rattlesnake Annex when purchased in 2013 by Lee and Sue Ann. Funny how none of us could know they had just started the process of me buying my dream home! The shiny new roof in January 2018 sort of highlights all the other work that needs to be done. But that’s OK. The Rattlesnake Annex began as a project house of Sue Ann and Lee’s. The plan was for it to house horse people attending clinics we hoped to hold, be a retreat center, or serve as a guest house once grandshildren arrived. This house means a lot to Sue Ann. It is not just some wood and nails. This house was across from our Hermits’ Rest ranch property, and was empty at the time, having previously served as the area’s main party house and HQ for “interesting” activities. Our neighbor noticed it was going up for auction for failure to pay taxes, so Lee rushed to the courthouse to bid. 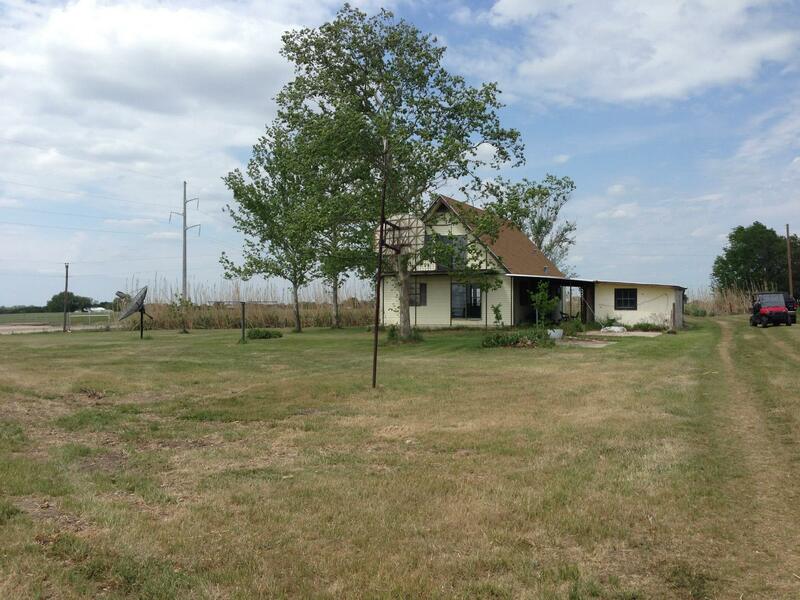 We got the house and seven acres for $18K. It was a HUGE mess. We spent 6 months hauling out trash (conveniently, some of it got removed, we assume by the previous owners), tearing up the interior and preparing it for renovation. Then we started work on our main ranch house and the Bobcat Lair project, so didn’t have funds to continue. It sat there waiting, getting mowed and housing owls. Anyway, I feel the same way about it. When I asked about buying it, I was looking at a house with rotten subfloors, no drywall, and basically just a shell of what was a house. Everything had been gutted to replace bad electrical work. “Bad” is putting it mildly. The previous owner was a “master electrician,” which meant there was a lot of “creative” wiring, and wires that went all over the property from when it was the party house of the neighborhood. 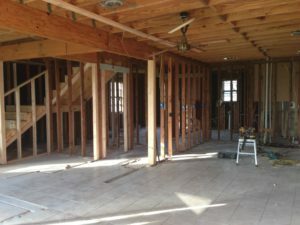 Sue Ann and Lee decided to do away with some walls and doors to make it a more open concept, which added much more room in the house. Not to mention the helpful change they made to the stairs. The top half had been installed upside down, so they were much steeper than the bottom half. That may explain all the holes there were in the stairwell. Now the stairs are open and the window there lets in lots of nice light. 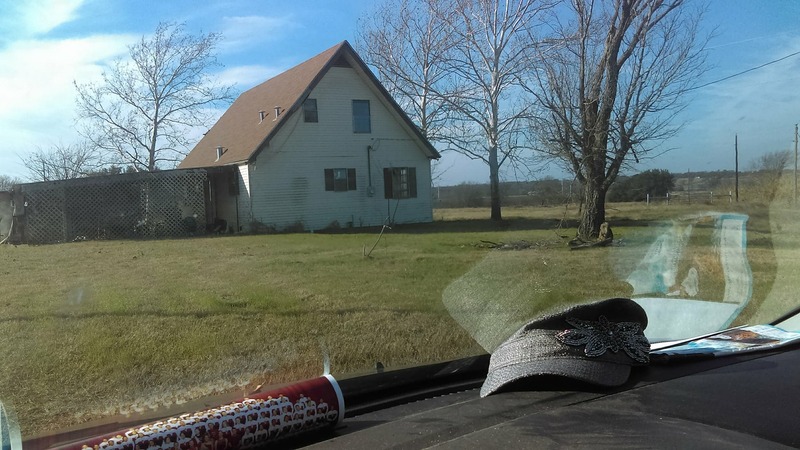 Now, I was “looking” at this house with so much needed, but what I saw was something totally different. I saw a house neglected and sad for many years with just a spark of hope in the studs. I saw an old farm house with what I call “a Granny kitchen” where my grandkids will one day run in without knocking and be starving for their favorite foods that only a Granny can make correctly. An old screen door on the back. The wooden ones, not a storm door for the kids to slam. A balcony that will hold just enough chairs for Sue Ann and I to watch horses and dogs from. A porch that will hold a swing that I can sit in and grow old. I see Christmas trees that could be as tall as 10 feet, where my kids and grands will have magic bloom for them in the center of the house every year when Santa has been there. I envision an island off the kitchen where my Dad can come sit and talk to me on the weekends, and where I can sit alone and talk to my Mom on the other days. Here is a view from the dining area in 2013. The drywall had come down, and the floor covering was on its way out. I’m only 36, my oldest kids are still in high school. This is thinking of the future. This is the house I want to grow old in. That means that I am very picky about what goes into the rehab of it. Now that I am going to buy the house, the term “annex” doesn’t fit it anymore. However, this house’s name is “The Rattlesnake.” It just fits the house. It got that name because of how many rattlesnakes were found when Lee and Sue Ann first started working on it. According to Sue Ann, there were over a dozen of them found in the house and barn. The old barn was falling down, so they tore it down. This encouraged the snakes to go next door to the abandoned house, or something. In any case, they seem to have moved on for the most part. Yes, there WAS a snake under the house not too long ago. The snake that Ryan found in the house was actually a cotton mouth, not a rattlesnake. I guess that one was looking for The Cotton Mouth House down the road. I hear it’s cold there, but the beer is warm. We all need to stop and ask directions sometimes. I met with a roof and spray foam insulation company Monday afternoon. I am excited about this insulation! It is Gaco Firestop 2. This insulation is rated to withstand contact with an open flame for six minutes before either shrinking, or melting. But it will not not catch on fire. That doesn’t make it fireproof, but it is definitely better than fiberglass insulation against dry wood. Here is a link that talks about this open cell foam and how it exceeds building codes. This will not be the cheapest way to go, but in the long run it will pay for itself with lower utility costs. Cheapest, does not equal best. This is the best option for my house I think. I have been to houses with spray foam insulation with thermostats set at 68 degrees during icy weather and are absolutely warm inside (Lee and Sue Ann’s ranch house, the Hermits’ Rest, is like this). Imagine how low your utility bill would be if you could have your thermostat set on 68 during an ice storm and no one complaining about the cold or trying to sneak the thermostat up to 80! I deal with a thermostat that gets set at 80, yet nobody will claim responsibility for it. I am ready to be done with those energy bills! Really and truly though, with the amount of money I will save on utilities, the upfront cost is a bit, but the long term is really inexpensive. Not even five years will have to pass for this insulation to pay for itself. The company also bid on adding in this insulation between the first and second floor of the house, because since there is no air in it, it makes a great sound barrier. With my plans on this being where my grandkids come to see me, my kids now, and my four dogs, anything I can do to muffle the THUNDER THUNDER of tiny feet is appealing to me! Here is the other side of the house just before Christmas 2017. The contractor that came out is also putting together a bid for a metal roof. Lee suggested it be done, and there is no time like now while it is under construction, right? Just so long as the budget holds for it. So far, especially with the spray foam insulation, I have heard no complaints. As a matter of fact, a friend of mine told me Monday night that she absolutely loves her metal roof. She and her husband just put one on their house. Sue Ann and Lee also love theirs, especially the low maintenance aspect of it. I should have all of the bids back within 48 hours. 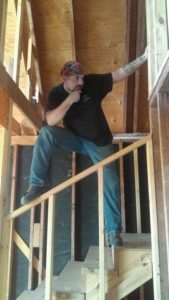 The contractor was going to climb the roof to measure, but once he got to the house, he realized there was no way he could get up there without proper equipment. That roof is steep! Fortunately it is a simple A-frame roof with only two sides, and no other pitches. That should help with cost, and also take them less time because of how straightforward it is. 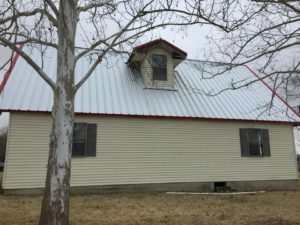 The contractor also suggests that when shingles are in as good of shape as the ones on that house are, to keep them on the house as an added layer of insulation and protection. The grid for the metal roof can then just be built on top of the existing shingles. He also added that the wear on the roof was caused by nobody living there and temperature inside the house not being regulated. This makes the shingles weaker. Isn’t it funny to think how a house could hold up for over 100 years with people living there, but can start to deteriorate so fast when vacant? (We see this a lot in Milam County.) Houses take love. You have to heat them, cool them, protect them, and be kind to them. When they need a repair, do it the right way as soon as you can. Home ownership is not cheap, but if you fix problems correctly as they occur you will save a lot of money in the long run. Take a leaky roof where a few shingles have blown off or been damaged for example. If you jump on it right away, you will replace those shingles, possibly a few other small pieces. If you let that leak go, you lose more shingles, have more leaks and could face electrical problems (depending on where the water runs). The whole roof is weakened by water in the wood, the drywall will get damaged eventually, then the ceiling tile will degrade, etc. The list goes on forever until you have black mold growing. Ryan holding the stairs down, December of 2017. He keeps it lighthearted and fun on the project. 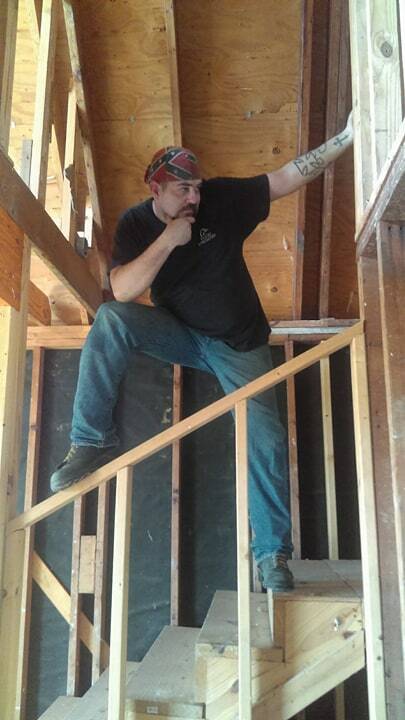 My request was for him to pose like he was trying to figure out something that needed fixing. I got his GQ pose instead, I think. Roofs are expensive, but you can’t live in a house without a water tight roof for long. I lived in one wherethe roof was just waiting to cave in. We discovered there had been a leak for many years, and one night I turned on the exhaust over the stove and water poured in from it. That shorted the fan out, popped, and smoked. The vent on top of the house shifted down about an inch, ready to fall back through the ceiling. Long about that time, probably a week later, I smelled electricity burning from the back end of the house. I called a local electric company, and the tech replaced the outlet and wires. He showed me where water had been coming into the roof on the opposite end of the house and leaking into this outlet for what he said was probably a year at least. It was just a blessing that it waited until a moment when we were home to try and catch fire. We have no way to know where exactly the original leak started. It could have started in the back part of the house, or it could have started at the vent hood and ran down to the back. We think that a storm blew a limb into the vent hood and caused it to come loose just enough to start a leak. There is no way to know exactly how long it had been like that. The year this happened was a very wet and stormy year. Oy, there are tons from 2018. Search for Rattlesnake.